To be notified of future updates, please submit your Ryerson University email below! What: DME Creators Grant, 2019. Value of up to $3000CAD for each of 5 grant recipients. Who: Open to current Ryerson University undergraduate students. Read more about eligibility here. 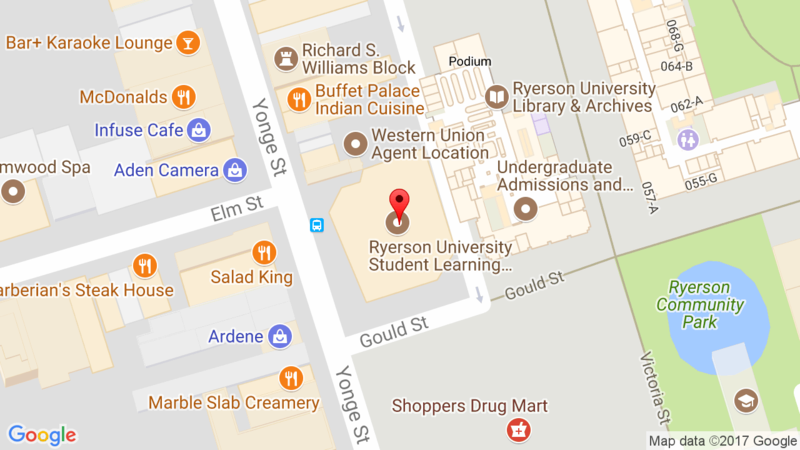 Where: The DME Creators Grant requires that recipients have regular hours during which they are present and producing in the Ryerson Library during Spring 2019 and Summer 2019 and September for the showcase. When: The application submission period will begin on January 28th, 2019. The deadline for submissions is on March 8th, 2019 at midnight (12:00am) EST. More information about timelines for the grant below. Next Information Session: February 27, 2019 at 1:00pm and again at 4:00pm in SLC 308. Let us know you’re interested in attending one of the info sessions by RSVPing here. The Ryerson University Library’s DME Creators’ Grants support Ryerson University undergraduate students who want to create innovative, sustainable, and interactive digital experiences and initiatives that address social equity issues. Successful applicants will receive a grant up to a total of $3000, with one portion distributed upon project approval, and the second portion distributed upon project completion and showcase. Continued participation in the grant program and full financial disbursement will be contingent on the participant reaching performance milestones, and presenting the completed project at a public showcase event organized by the Library. Ryerson Library DME Creator Grants are intended to grow and diversify undergraduate student representation in digital media learning and skills development at Ryerson. The grants support the Ryerson University Library’s mission statement, particularly its commitment to enable users to create knowledge; to engage students, faculty, and the greater community in its goals and activities; and to foster critical thought, lifelong learning, and city building. Ensure that all Ryerson undergraduate students are encouraged to develop marketable digital skills while at university. Increase interest and opportunities for students who self-identify as part of underrepresented groups in STEM. Focus students’ energy and creativity on addressing issues of social equity using the skills they learn from the DME and its partners. Partner with graduate students via the MDM Program to create mentorship learning opportunities and meet MDM program requirements. Grant awards will be funded to a maximum of $3,000 CAD per project per cohort. Recipients are limited to one project per cohort. Each cohort will consist of a maximum of five projects. Grants can cover costs related to approved project work hours, materials, and specialized technical services not available through Ryerson. All currently enrolled Ryerson University undergraduate students with a clear academic standing, and a minimum 2.33 GPA in the previous semester are eligible to apply. We are committed to fostering diversity within our community. We welcome applications from those who would contribute to the further diversification of our organization including, but not limited to, women, visible minorities, Aboriginal people, persons with disabilities, and persons of any sexual orientation or gender identity. If you have already applied to or received other awards for the same project/business idea, you are still eligible to apply for the DME Lab Creators Grant, however, your application must represent a different scope of work. Teams are not eligible for the DME Lab Creators Grant. Students employed by the Ryerson University Library are not eligible for the DME Creators Grant. Applications will be reviewed by a Library-chaired interdisciplinary selection committee based on the following established grant criteria / assessment rubric. Examples of the sorts of project formats we’re looking for could include digital art installations, interactive documentaries, community health apps, or robots that water your community garden, etc. Examples of social equity issues include institutionalized discrimination, access to digital education resources, environmental justice, gentrification, etc. Shortlisted applicants will be invited to meet with the Selection Committee to discuss the proposal in more detail and review commitments and deliverables related to the grant. Ready to apply? Read this first! Applications that are not submitted will not be saved. So when you are ready to apply, please do so in one session. If you submit an application and later decide you wish to alter your application in any way, you may re-submit the entire application again as many times as you wish. ONLY THE LAST APPLICATION YOU SUBMITTED WILL BE CONSIDERED.